First came the Standing Rock Sioux. Then the other tribes joined them. Then came the outsiders. Calling themselves “allies,” many drove up in Bernie-bumper-stickered cars, bringing donations of food to the camp, or wood to help make shelters for the ever-growing population. Veteran attendees of Burning Man and other festivals actually bring a useful expertise: making a temporary city. Many are highly skilled in construction and are helping to build housing as the North Dakota winter intensifies. 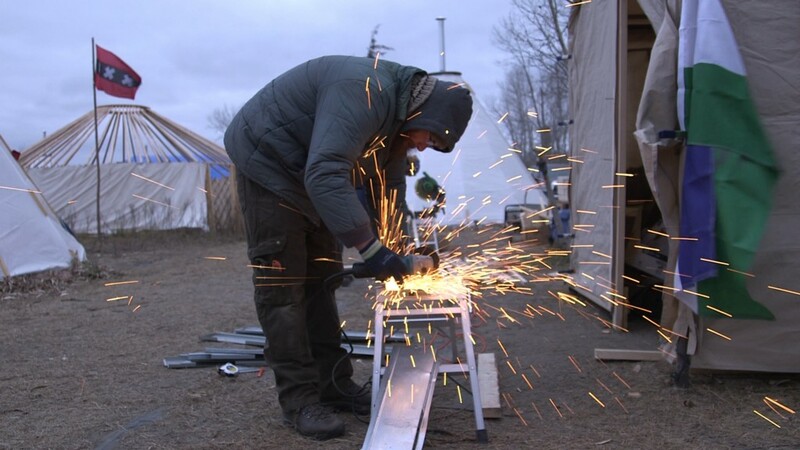 Bundled-up crews of progressive whites from Seattle, men with beards and women with dyed-green hair, saw wood for “tarpees” — canvas teepees with wood stoves. Most outsiders you talk to echo the almost identical, genuinely well-meaning, spiritual “call” to be here. For the most part, the indigenous people here appreciate the support. But the cultural differences have caused friction. Every morning at 9 a.m., there’s an orientation session for anyone new to the camp. Cultural traditions are explained, as well as general rules: No filming anyone without his or her permission; no filming of prayer or ceremony. A sewing tent has been set up where visitors who don’t have long skirts can make them. “It’s been an organic development of how to address [conflicts] as they come up,” says Danielle Gennety, who came to the camp in October. Gennety has a background in setting up festivals as well as a strong education in perma-culture and eco-friendly living. Marcus “Quese IMC” Frejo, a member of the Wolf band of Pawnee and the Bear clan of Seminole, traveled here from Oklahoma in June to show solidarity with the Standing Rock Sioux. He’s set up an area within the camp for other Pawnee who visit. One evening he came home to find “four white kids in our camp,” he says, looking for a warm place to spend the night. He told them he set the camp up as a spiritual place for other visiting Pawnee. Talk to many of the indigenous people here though, and it is, in fact, very clearly about stopping a pipeline. 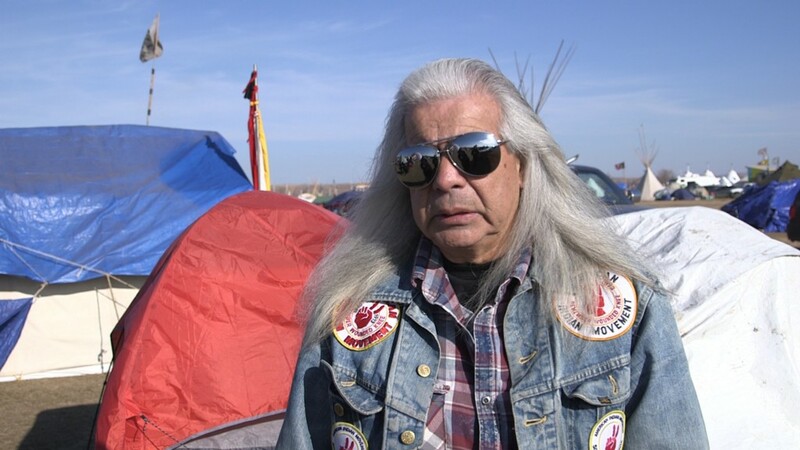 “I get tired of people saying, ‘I support you,’” says Graywolf, the director of the Southern California chapter of the American Indian Movement, who’s been living here at the camp. Graywolf. Photo by Duy Linh Tu. The media, he says, tends to only cover the demonstrations at Standing Rock when large groups of people turn out to gather by the barricades on Highway 1806, and when they are met with police violence. Graywolf, who is 71, has been heading out to the front lines in peaceful demonstration every chance he gets. “When non-native people come up to me and say, ‘What can we do?’ I say, ‘You need to not be our ally. We don’t need allies. We need accomplices.’ What that means is — you need to be on the front lines with us; you need to be out there battling with us,” he says. Graywolf notices it happening more now. Outsiders who come to the camp may show up with a preconceived idea of what their contribution will be, and then pivot. One man came to the camp offering his chiropractic services. A woman who runs one of the kitchens here asked him to peel potatoes instead. He obliged. 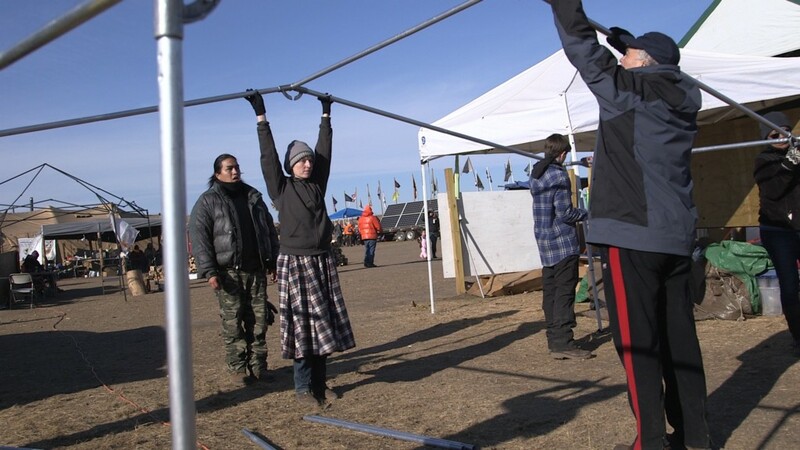 He worries about who is going to have to clean up the camp when everyone is gone, and that it will fall to him and the Standing Rock Sioux tribe. Gennety is focusing on efforts to minimize waste at the camp. At the dining hall tent she oversees, there are no plastic cups or paper plates. She asks that everyone show up with their own reusable mugs and dishes and wash them after. She used recycled pallets and 2-by-4s for housing. “You can build a whole city with pallets!” she says. The Army Corps of Engineers ordered construction of the 1,200-mile, $3.7 million pipeline from North Dakota to Illinois to be paused for environmental review and further consultation with the Standing Rock Sioux tribe (though most of the pipeline is complete). Energy Transfer Partners, the company building the pipeline, has filed suit against the Corps, saying that it’s a done deal and they have permission to complete the work. Just last week, the Corps gave an “eviction notice,” saying that, for public safety reasons, everyone in the camps north of the Cannonball River must vacate by Monday, December 5. They added that they will not be forcibly removing anyone, but North Dakota’s governor sent out a mandatory evacuation order last night. So far, people are staying put. New people are still coming to the camps. People who have left are coming back for a second or third time. There’s snow on the ground at Standing Rock now. As temperatures continue to drop, it remains to be seen how many people will stick around. Ultimately, the outsiders get to go home.